Jay Scott Wood did some pictures for me and the results were Incredible he was easy to work with very skilled & knowledgeable; a true craftsman. He takes his work very personally which can be seen in the finished photos. Excellent work. Thanks Jay Kenneth R.
It was such a joy to work with you last summer and I cannot wait to do our second shoot! Thank you for your patience with us, and working with us all day to find the perfect locations. Sonya A.
Jay the pictures of our daughter are amazing! You did a wonderful job. I can't wait to share the gallery with our friends and family. Thank you again Selena E.
Jay, thank you for a fabulous and fun photo shoot. Not only was the location you chose amazing, but the pictures are incredible! We are extremely pleased with and excited about sharing our pictures! 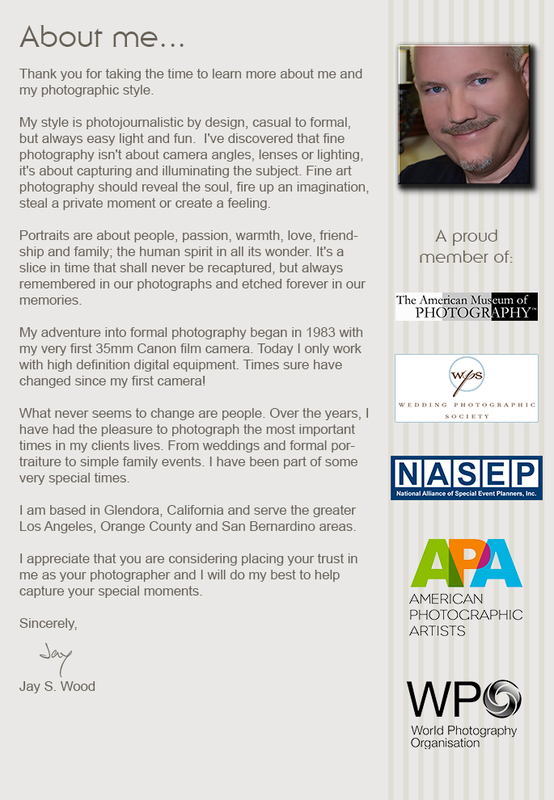 Monica M.
Jay Scott Wood was easy to work with, very skilled and knowledgeable in all aspects of photography. The finished results were excellent. Thanks Jay. Ken M.